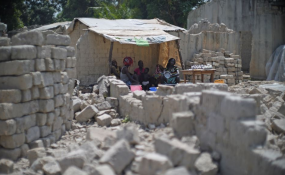 A family uses tarps taken from a refugee camp to get shelter from the sun, with bricks for rebuilding their homes all around them in the PK5 neighborhood of Bangui. Bria — The sounds of heavy gunfire drew Herman Pouka from his house one morning last week, putting him face to face with armed men in camouflage. "As soon as I saw them I lost my senses," he recalled. "I ran." He hid in a neighbour's house until the firing subsided, then donned women's clothes to flee towards a nearby UN base. "They don't do anything to the women. Us? They kill us," he explained. He joined some 40,000 others who'd fled an eruption of violence in this central mining town. About two dozen people were killed in the fighting - including Pouka's brother, Jonathan. Jonathan had been walking with a friend when firing erupted; the friend ran and later recounted hearing Jonathan's cries. "He was so fun. He smiled a lot," Pouka said, his body starting to shake before he devolved into guttural sobs. "We haven't been able to bury him... The pigs ate at his body." The fighting in Bria is the culmination of a spasm of violence that killed about 300 people in two weeks around the Cental African Republic. It has sent shockwaves through an already traumatised population and ripples of fear throughout CAR that the country is descending back into chaos. A predominantly Muslim rebel coalition known as the Seleka toppled CAR's government in 2013, looting and killing its way through the country. Local defence groups dubbed the anti-Balaka rose up to fight them. Both sides were accused of atrocities. The arrival of UN peacekeepers in September 2014 helped staunch the bloodshed, but not before thousands of lives were lost and some 800,000 people forced from their homes. A democratic election was held in 2016 - which was billed as a sign of hope for CAR's future. But just over a year later, those hopes have all but evaporated. And the international community has started to withdraw and look away. "Elections should not be made as a benchmark for the international community to leave," cautioned Joseph Inganji, the UN humanitarian agency's chief of office for CAR. Today, CAR's democratically elected government wields little to no power outside of the capital, Bangui. More than a dozen armed groups control vast swathes of the country, exercising their own brands of authority from taxation to justice. And the shaky calm that had held since the election has in recent weeks erupted into violence at a level not seen in years - some say since the peak of the conflict in 2014. The fighting has taken on ethnic dimensions, adding another layer of complexity to an already complicated and fragmented crisis. The UN said on Thursday that 300 people have died in renewed violence in the past two weeks. There was an attack on the southern town of Alindao. A days-long assault on the southeastern town of Bangassou followed. Six UN peacekeepers were killed in the span of a week. And then the guns started firing in Bria. "The situation is worsening," Inganji said. "We can only know the consequences that are related to this upsurge of violence, but actually who is behind that or why the violence is increasing, we really do not know." A November attack in Bria was still fresh in the minds of those in the town when fighting erupted last week. When it comes to the question of why the situation has exploded anew, the answer is: It's complicated. Locals and analysts alike tend to reject the idea religion is - or was - truly behind the initial crisis and today's violence. They say it's more about power, and profit. Some analysts suggested that armed groups grew tired of waiting for promised positions in the government and broader representation - like the ex-Seleka in particular. Others said it's about CAR's multitude of natural resources; more still said it was just too difficult to know what exactly is driving the violence. "The promises or the hope that the elections brought about ... haven't materialised and we continue to see serious challenges with issues like disarmament, demobilisation, reconciliation and very importantly justice and accountability," said Evan Cinq-Mars, a CAR expert and a policy adviser at the non-profit Center for Civilians in Conflict. "All of these outstanding issues not being resolved are contributing to these cycles of violence ... and the upswing." Still, he said the violence must be viewed in the context of a broader deterioration of the security situation and civilian protection since mid-2016. That's when different factions of the Seleka attempted to align themselves under one broader umbrella movement. However, one faction known as the UPC resisted. "That really kicked off what we've seen since November - particularly in Bria, Bambari, and other areas of the east and south," Cinq-Mars explained. Now in addition to fighting each other, armed groups are targeting civilians based on ethnicity, religion, and perceived support for other combatants. That means it's becomes increasingly difficult to figure out who is fighting who. These days, it's not just the ex-Seleka or anti-Balaka. When it comes to the recent attacks, "people need to start asking questions about who these individuals are, who they're tied to", Cinq-Mars said. The Seleka were at the outset an alliance, or coalition, of predominantly Muslim groups. Those have since fractured. "The term ex-Seleka - I don't think it's very useful anymore because the efforts to bring all different groups under one umbrella have not really progressed," Cinq-Mars added. "Now, they don't call themselves that. They call themselves the FPRC, the UPC." At least one faction of the ex-Seleka - the FPRC - has struck a tenuous alliance with elements of the anti-Balaka, once their sworn enemy. They united to fight against the UPC and - according to some - the Peuhl ethnic minority. The UPC's leader is an ethnic Peuhl. The nature of the anti-Balaka is even harder to pin down given that the term from the outset referred to a disparate grouping of local self-defence militias with no clear chain of command. To Cinq-Mars, billing recent violence as clashes between ex-Seleka factions and anti-Balaka could even be counterproductive. "I'm not sure that calling these groups one name or another adds anything but more questions because it's really difficult to nail down who's committing what," he added. That doesn't mean civilians are any less scared of what is to come. "People are very nervous about the situation," Oxfam's CAR country director Ferran Puig told Al Jazeera. "The tension is very, very high." He described how security and alliances change in CAR from day to day, calling the situation "very confusing". "What needs to happen is really for [armed groups] to stop this fighting, to negotiate a peace agreement or something like that... Just think about people," he said. "But now it looks like that's really a dream, at least for the short term." The south and southeast of the country are of particular concern going forward - not least because the UN peacekeeping mission is overstretched and under-resourced. The withdrawal of US Special Forces and Ugandan troops too - deployed in the southeast of CAR in search of LRA leader Joseph Kony - isn't expected to bode well for civilians. "It's contributed to a larger security vacuum in that region of CAR that is certainly posing problematic as the situation deteriorates in the south and southeast," Cinq-Mars said. "In the absence of international peacekeepers and given the fact that this is an area which largely does not have any state presence, we're going to see armed groups continue to control vast swathes of territory in CAR and subject civilians in these areas to abuses, extortion, taxation." In the meantime, aid agencies warn the number of internally displaced could soon hit 500,000. Compounding matters is a grossly underfunded humanitarian aid appeal - at just 16 percent - in a country where half the population is in need of assistance. The pope last week appealed for peace in Central African Republic and the International Criminal Court said it was "monitoring" the recent wave of violence. For now, Bria is calm but tensions are still running high. Officials say members of armed groups have infiltrated sites for the displaced. Fighters can be spotted throughout the town - along with packs of pigs, foraging in the mud and grass. The fighting displaced almost the entire population of Bria, giving the red-dusty streets the eerie sense of a ghost town. By Friday signs of civilian life were returning - a few shops had opened and some people appeared to be returning to their homes. Sylviane Longago, though, said she would not be among them. "The house was burned. Where will I go?" the 42-year-old mother of eight asked, crouching in a muddy site for the displaced. "I have no option other than to stay here." She was with her husband and children when shots rang out on Tuesday, telling Al Jazeera even the small ones understood the noise meant danger. "I left with only the clothes I'm wearing," she said, pointing to her blue yellow and green wrap. "We fled into the bush." Longago said she passed out from duress amid the chaos; her husband was shot in the foot while carrying her to safety. On a recent afternoon they sat in an empty and half-finished shelter, a filthy bandage covering her husband's wound. "I don't know what we're going to do," she said, listing off what her family had lost. "Even the children's notebooks, their clothes - burned." "Who is the one that did this and can feel nothing?" she asked. "Everyone feels something." She added: "They're thieves. They came just to steal. Justice must be done."